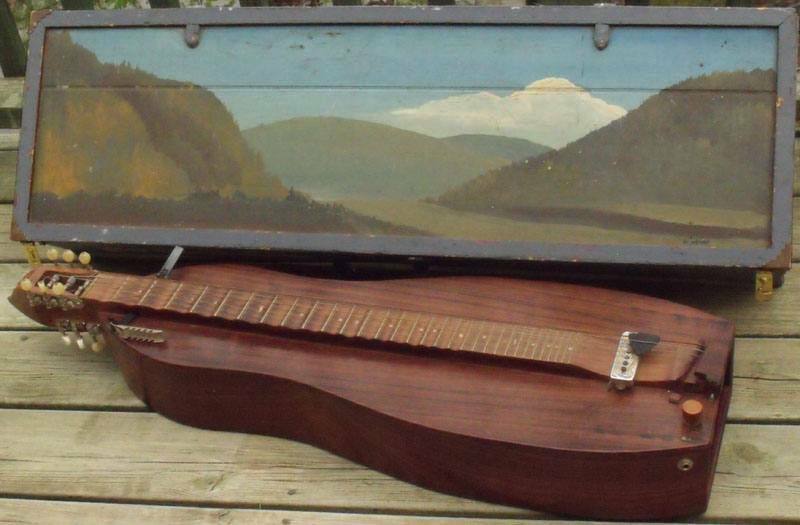 An all-rosewood baritone 6-string chomatic scallop-fretted dulcimer with a great sound. Purpleheart bridge. Shell dust fret markers. The wood was bought at a time when I didn't know the Rainforests were disappearing. The mellow electric pickup with red cedar pot knob was added later. The six sympathetic strings run inside the body with their own bridges, and serve as a truss rod. It's the rhythm dulcimer on Rockingham Cindy , Year of Jubilo, Over the Waterfall and Cotton Mill Girls (where it's also the solo dulcimer); and the baritone (third) dulcimer on Juniper Springs. Box landscape of the view from Janette Carter's house, Hiltons VA by Patricia Windrow. The name means "Hidden Love".